Fits up to a 15" neck. Additional links are needed for larger dogs. Chromium Plating: How do we reach the brilliant and durable surface on our chains? Whereas other manufacturers only dip the chains before galvanizing, Sprenger uses a different procedure of mirror-bright polishing. Dipping means to remove non-metallic unclean things like oil from the chains. The metal becomes clear but has no surface polishing. The advantage of our polishing is that the surface becomes much smoother and has this special bright shine. 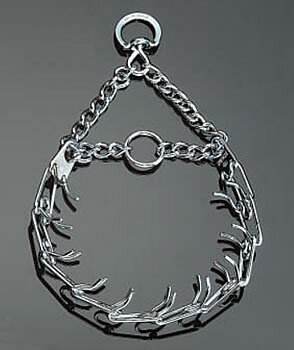 After tumbling, the chains are nickel or chrome plated. Our nickel and chrome baths are monitored permanently by a laboratory. Sprenger examines the grip of the nickel layer through „bending” tests before the chains are chromium plated.